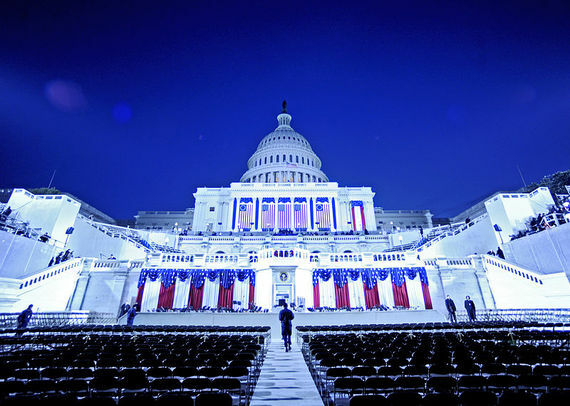 In less than 24 hours you will stand on the steps of the Capitol and take an oath to become the 45th President of the United States. The world will watch as you place your right hand on President Lincoln's inaugural Bible and swear to "preserve, protect and defend the Constitution of the United States." Once you do, you'll join federal workers who have already taken their oath to protect the Constitution and serve all American citizens. Together, we have made a solemn promise. We have agreed to set aside personal and political differences to do what is right on behalf of the American people. Over the last 18 months, you have campaigned on the idea that Washington is broken. You said you were the man to fix it. You wanted to come to D.C. to "drain the swamp." There are many so-called proponents who claim they want to do just that. But really, they come to D.C. either as a Member of Congress or a lobbyist on behalf of big business to feed in the swamp. They propose policies to arbitrarily cut dedicated servants, not for the good of the American people, but simply so they can feed their unlimited appetites for greed. These policies only serve to make the swamp bigger - and run in direct opposition to your promise. Mr. President-elect, we urge you to reject those phony voices. On your Inauguration, we appeal to you to consider a few facts before you allow those big-business interests to persuade you to do the wrong thing. Today, after decades of explosive growth, there is an approximately $500 billion shadow contractor workforce. Meanwhile, today's government workforce is smaller or roughly equivalent to the workforce at the time of President Kennedy despite massive population growth. Those who work for the government are dedicated to the American public. They quietly deliver taxpayers' social security checks, inspect the food we eat and the water we drink. They support our military, and ensure the safety of our skies, borders, and seas. They assist their fellow Americans and communities in times of natural disasters, or work to prevent epidemics at the Center for Disease Control. They've committed to deliver good government to all Americans, and do so every day. But, despite that, some of your transition team has labeled these dedicated Americans and the backbone of our country as a Washington-based "problem." Did you know that 85 percent of Federal civil servants live outside of Washington? And that half of them are veterans, or have a family member who served to protect America? Or that our members earn, on average, only $500 a week? How about the fact that they've been forced to give up $182 billion in wages and benefits (that's $91,000 per employee) since the start of the decade to reduce the deficit? And the already announced hiring freeze and workforce reductions will actually allow for an even larger unaccountable contractor workforce to run our government from the shadows - at a far greater cost to taxpayers? Federal workers are the ones who are best equipped to keep our country running. They're hired on merit, are accountable to the American taxpayer, and work far more efficiently and cost effectively than their private counterparts. And unlike the contractors who currently operate in the shadows free from scrutiny - and whose only allegiance is to a corporate bottom line rather than the needs of the American people - government employees have taken an oath to uphold the Constitution and put their work before politics or party. "Drain the swamp" means recommitting to doing the people's business for the sake of public service, not profiteering and self-dealing.